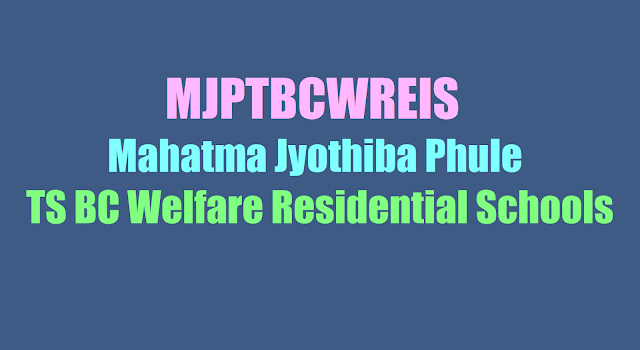 Mahatma Jyothiba Phule TS BC Welfare Residential Schools open on June 12: TS BC Welfare Residential schools to open on June 12/ MJPR Schools to open on June 12/Mahatma Jyothiba Phule BC Residential Schools to open on June 12/ MJPTBCWREIS Residential Schools to open on June 12: 119 Mahatma Jyothiba Phule Residential Schools(BC residential schools) will be inaugurated on June 12 for operating the new educational institutions. The schools will be inaugurated on June 12. Proposals were prepared for building the institutions on a sprawling 10 acres of land each and they would be equipped with modern facilities. Till the completion of the construction, the schools will be run in rented premises. Classes from V to VII will begin their academic year. Basic amenities were created in the temporary buildings for smooth conduct of academic activities. Students would be provided with quality education, enabling them to compete with their counterparts studying in corporate educational institutions. Keeping its promise to establish 119 BC residential schools covering all Assembly constituencies in the State, the government gave administrative sanction for setting up of these institutions. The new BC residential schools will start functioning from the 2017-18 academic year from class V-VII. Out of total 119 residential schools, 63 have been allocated for girls and 56 for boys. Highest number of residential schools have been allocated for Hyderabad as it has fifteen Assembly constituencies followed by Rangareddy with seven. The order also directed the Secretary of Mahatma Jyothiba Phule Telangana BC Welfare Residential Education Institutions Society to take necessary action immediately to identify the suitable buildings for starting classes from 2017-18 academic year. After its announcement for setting of residential schools for the BC community, the government issued orders in this regard in a record time. Residential schools to be named after Mahatma Jyotirao Phule: In a fitting tribute to the 19th century social reformer Mahatma Jyotirao Phule’s pioneering work for the uplift of weaker sections, the Telangana State government decided to name the Residential Schools for Backward Classes in the State after him. The government had formed the Mahatma Jyotiba Phule Telangana Backward Classes Welfare Residential Educational Institutions Society to run the residential institutions with the objective of providing quality education, even in English medium. The new institutions coming up under the Mahatma Jyothiba Phule Telangana Backward Classes Welfare Residential Educational Institutions Society (MJPTBCWREIS) were emerging as the envy of even the best private schools. Every residential school would take 240 students- 80 each in class 5, 6 and 7. The institutions would be upgraded in a phased manner. Provision of mattresses, cots, dual-desks for the inmates and tables and other furniture for the teaching staff was taken up on priority. Uniforms would be provided to the students of all the 119 institutions simultaneously by August 15. The hostels were being provided with LPG connections with seven refills each. All the BC Residential Schools and Colleges in the State follow English as the medium of instruction. Yearly calendar is being implemented to impart quality education to the students. Computer labs have been set up to provide computer education to the students. Students are encouraged to participate in curricular, co-curricular and extracurricular activities. 119 BC residential schools are opened across State. Telangana government has launched 119 BC Residential Schools to provide quality education to the Backward Classes students and spending Rs 1.20 lakh on each student per year. The government was aiming to provide quality education to all sections of society. The government is sincerely committed to offering quality education to students from Backward Communities by spending Rs 2 lakh per pupil and roping in qualified teaching staff. Heralding a new era of quality education for underprivileged sections of society in Telangana, a total of 119 Backward Classes residential schools were inaugurated on a single day across the State on June 12. This massive foray into education is part of the TRS government’s fulfilment of its poll promise of providing KG to PG education for all in general and KCR's dream of knowledge empowerment of the weaker sections of society in particular. Termed as the biggest exercise undertaken by any State to impart quality education across the State, the opening of these residential schools, which boast of good faculty and excellent infrastructure, is expected to bring about a radical change in the social engineering in the State with thousands of underprivileged students passing out of these institutions. The Chief Minister, hailing the achievement, said the efforts were aimed at imparting quality education on a par with international standards for the SC/ST/BC and minorities. He called upon the students who joined these schools to take inspiration from Mahatma Jyotirao Phule and Babasaheb Ambedkar and come up in life. “I am happy that as per the promise given in the election manifesto, the beginning for KG to PG education for the weaker and backward section children has begun with the residential schools,” he said, adding that before the formation of the State, there were only 259 residential schools for SC/ST/BC and minorities, which within three years of the State coming into existence, had gone up to 527. In future, there would be 786 residential schools in the State,” he said. Pointing out that half of the residential schools were exclusively meant for girls to encourage them, providing them facilities and protection, Rao said the government will spend Rs 1.25 lakh per year on an average on each student. The government residential schools provide free education, meals and boarding to the students till Intermediate level. “My aim is to make even the poor students get quality education and attain higher place in society,” he said, adding that the government started the residential schools in a big way with English as medium of instruction so that the students who pass out of these institutions could lead the country in future. Students passing out of the residential schools should secure good ranks in admission tests like EAMCET and IIT JEE and get into prestigious institutions in the country.